It's funny. Although I am a dedicated fan of all the titles on the Activision O2 charter, I thought this game would be the lemon of the bunch with it's subject. What the hell could be interested about a dude getting dragged around behind a boat? For starters, who the hell is Shaun Murray? Secondly, what the (insert expletive) is wakeboarding? Well I can answer the second question with absolutely no authority, but with a little bit of information. Wakeboarding is as exactly what the word says it is; you ride a board through and over the wake created by a speed boat. 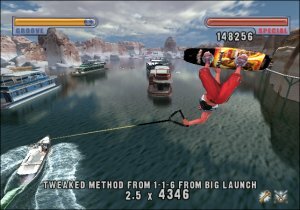 Similar to water-skiing however with a more extreme angle on the whole thing involving a variety of tricks and stunts. I guess one of the first things that people think when it comes to the 02 line is that it's another one of those "Tony" games and so far pleasantly enough all of them have proven to be great games in their own right, even the much maligned Shaun Palmer Pro Snowboarder (which I actually enjoyed). Wakeboarding Unleashed at first presented a not altogether attractive prospect, primarily the fact that I knew that I was going to be stuck on a single course and have to hang onto a stupid rope that would drag me around said course! Boy was I ever wrong! The game is developed by Shaba Games and they have certainly taken an exciting sport and notched up the adrenaline level tenfold. The very nice thing about the title is that the creativity behind the game is across the whole, as opposed to only rearing itself in key areas. Even the soundtrack, the tracks of which would never be played as music in my stereo, work perfectly with this game and don't jar on you at all. Right up until the point that I finally heard a track start up, The Pixies "Wave of Mutilation" and then I was truly in heaven, having been a fan of Frank Black and co. back in the day. Back to the game however. The title starts the same as all the others in the 02 stable with you choosing a career mode, your character etc etc. Then it's into the first level to get a feel for the way the game engine behaves and what the general physics are like, and I am stoked to say that this is some of the best water that I have seen on any machine for a long time, with both gorgeous looking water and lovely wave physics to boot. The best advice that can be given to any new player to this title is quite simply, take your time and practise, practise, practise! Despite the apparent limitations of being behind a boat, guess what? You can release from the rope any time you please, and if you hit the wake at the right time, the air that you are going to grab will astound you. There are ways to choose which direction the boat is going to take as well. A well place rope release combined with a grind move will force the boat around to fetch on the side that you have chosen as a rule which will briefly give you other choices to find paths previously inaccessible, until the boat resumes it's predetermined course, of course. 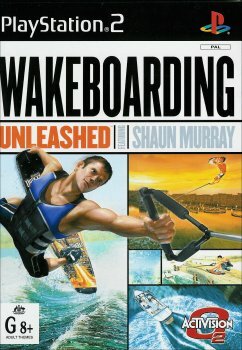 As with the other extreme sports titles, Shaun Murray starts you off with the basic abilities and trick sets of any aspiring amateur and as the game progresses, you can earn further stat points that will increase your skills across the board in order to make you even greater on the wake than you already are. Each level presents the player with increasing levels of difficulty to increasing your stats is an integral part of enabling you to proceed through the game. Of course to make this game even more interesting than it could have been, Shaba have made a lot of fantasy runs and tricks. This will allow players with a good eye for big air and stringing together combos, to rack up some truly amazing high scores. 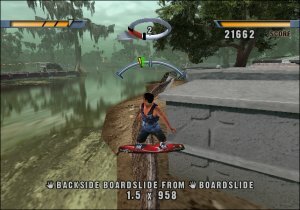 The revert, a move that is now integral to Tony Hawk as any of us who have played the series for some time will attest to, is in this game and although I thought it would be stupid putting this move on water, the animation is carried across fantastically and you don't really question it after a while. Of course with any game there are a number of small gripes, but nothing really to detract from my overall impression of it. 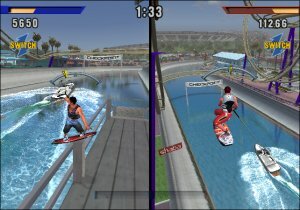 You cannot create a wakeboarder and the amount of sounds used in the game is a bit sparse. Finally, there are only 7 pros to choose from. This last point I didn't care less about considering I don't even know who the lead character from the game is, but there's always going to be someone who complains. Aside from the fact that career mode is going to take you a seriously long time, Shaba have also incorporated many multiplayer facets to the game, the coolest of which is when you and a mate can play together; one as the boarder and the other controlling the boat! This is extremely cool and adds a whole new element to the game. Graphically this game is extreme eye candy as far as water and character animations go, however on some occasions the colour palette looks a bit sparse and a bit washed out. Other than that, the game looks gorgeous and plays that way too. Everything said and done should see this game taking an awful long time to complete and once again Activision 02 are responsible for my aching thumbs and fingers. Get this game and get it now!